Tallahassee: Charles H. Walton, State Printer, 1872. Stitched, untrimmed and uncut. 350, [2 blanks], 76 pp. Except for a spotted title page which is chipped at the blank corners, a clean, Very Good copy. 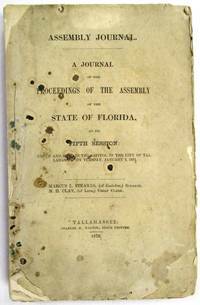 An informative Journal recounting Floridians' resistance to Radical Reconstruction. Governor Harrison Reed's Message addresses ongoing disturbances and "fatal and disgraceful violence... Nine-tenths of the suffering induced has fallen upon Republicans, and mainly upon colored citizens-- giving unerring evidence that these excesses have been strongly tinctured by, if they have not entirely originated in, political prejudice." Many murders and disruptions had occurred in Calhoun and Jackson Counties, forcing citizens to flee their homes and seek shelter in other parts of the State. A Committee of Five was appointed "to examine into the cause of said murders, and to ascertain why the perpetrators have not been brought to justice..." The Committee concluded that "there exists an organized band, whose object is to resist the laws, and who are the supposed authors of the many murders and outrages committed in the county." Threats of violence and a "reign of terror" had deterred witnesses from coming forward. In Jackson County "no less than one hundred and eight -four murders, fifteen of the number being women and children, and almost the entire number being colored people, brutally assassinated by this band of outlaws for daring to think for themselves." Similar outrages occurred in Lafayette and other counties. Governor Reed, Florida's governor from 1868-73, faced impeachment charges from this Assembly, as he had in 1868 and 1870. He was later charged in sixteen Articles with illegally issuing state bonds, embezzlement, and bribery. The charges were dismissed. The Assembly treated other matters of government, including special elections marred by violence; "an act to incorporate Brown's Theological Institute," now Edward Waters College, founded in 1866 to educate former slaves and considered the oldest historically black college in Florida. Senate Bill No 82, "to be entitled an act to incorporate the Buckingham Smith Asylum for the colored people of St. Augustine," was passed.